Out to the Limerick D&B/Jungle crew! Ice Cold Blood gives me the kind of spine tingle, hairs on end that I used to get from the early photek / digital / spirit sound from back in the day. Both tracks are superb, but Ice Cold Blood is stone cold killer. Love these. Fantastic drum programming on this one, especially concerning "In Cold Blood"! 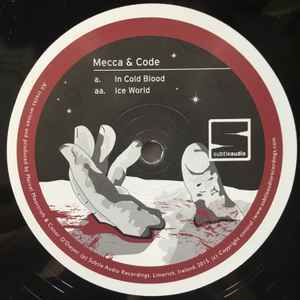 Great debut from Mr. Code and brilliant example of drumfunk music, a must-have for every choppage fan. Big up and thanks for keeping this music alive! Fantastic release, both sides sound like they could be off of Platinum Breakz 2 or something of that Blue Note era, which is a great thing. Vocal samples really put this one over the top. "In Cold Blood" is ridiculous. A long-awaited and great first release from Code.